Dorema introduces their latest Starcamp Tourer full caravan awning for 2019. 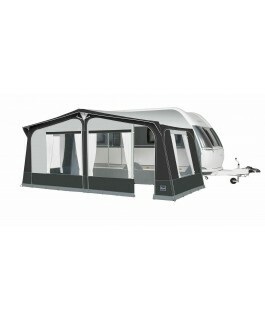 This caravan awning is perfect for short breaks and touring with your caravan, offering a fantastic value for money. It has been created using a lightweight coated polyester material for the walls and TenCate coated polyester for the roof material. This lightweight material allows for easy set up giving you more time to relax on your holiday. The Starcamp Tourer full awning comes as standard with a 25mm steel frame but you have the option to upgrade to either an Aluminium EasyGrip frame or a Fibre Tech plus frame which helps to reduce the weight of the awning. Each of the side panels are fitted with a door and can be fully zipped out and replaced with the optional tall annex. This is a great way to create more space for storage or with the use of the inner tent, an extra sleeping accommodation for guests.